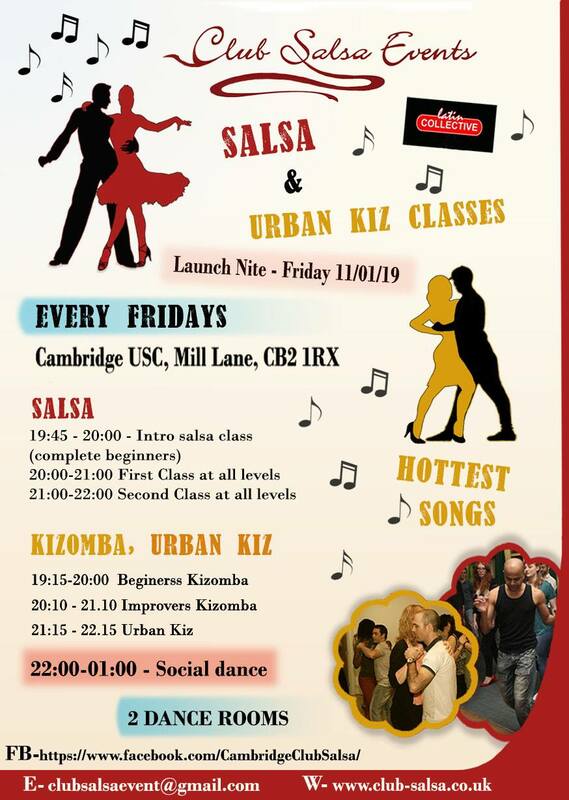 Club Salsa Events is Cambridge's premier promoter of Salsa & Kizomba classes and Club nights - SalsaKiz Cambridge. We have Salsa classes at all levels, from complete beginners to advanced, these are the most comprehensive dance class events in Cambridge. Owing to the size and standard of our classes and multiple levels, we can regularly invite international guest teachers, the very best on the Salsa and Kizomba scene. Our social nights are packed with dancers from all around Cambridgeshire and Anglia, also from London and many other places. Our weekly Friday nights and monthly Kizomba night run until 1am, making us the only place in Cambridge that gives you this extra dancing time. We have two social dance rooms, the main room for Salsa and Bachata, and a second room 100% Kizomba. With the Latin Collective, London's biggest Latin Dance promoter, and our local team members, we provide expert classes in Salsa and Kizomba from absolute beginner to advanced level. Dance is a great way to meet people, keep fit, and have an enjoyable time in a very friendly environment. There's no need for partners or booking, just turn up for the classes; all our classes are drop-in, not courses, and we have an absolute beginners' class on each of our nights. You do not have to be a student to attend our classes, including at the USC. Everyone is welcome. Our Teachers and DJs may be hired for corporate events, birthday parties, school and college discos, May Balls and weddings. We have lots of experience and can play a wide range of music including Salsa, Mambo, Bachata, Kizomba, Reggaeton, Merengue, Latin, R&B, Pop, Dance and Seventies, through to the latest International music. Our DJs are available to travel all over the UK and Europe. Email clubsalsaevent@gmail.com or Tel 07782 218745. Event Headlines are below. Join our mailing list here (we send no more than two emails a month). We are at these Venues with these Weekly Salsa Classes & Club Nights. We have two dedicated pages on facebook. Weekly pictures, weekly events, blog and any late changes are posted there. 1- Weds 17th April: "Kizz me Weds" @ SPC. Running as normal. 2- Fri 19th: No Salsa at USC on Good Friday but we will be running the event at SPC. 4- Weds 24 April: "Kizz me Weds" @ SPC. Running as normal. 5- Fri 26 April: " SalsaKiz Cambrigde". We are back at USC as normal and thereafter! 6- Sat 27 April: " Kizz me Cambridge. Monthly Saturday Kiz & Bachata event @ USC. Kizomba/Urban Kizz and Bachata classes. 2 dance rooms. 7- Monday 29 April: Note we will run this event at USC instead as SPC is not available for the whole week. 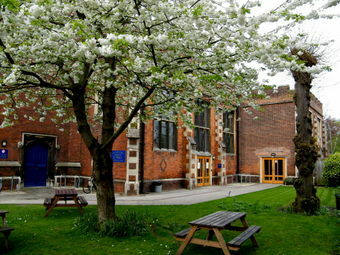 We are back at SPC as normal from 6th May and thereafter. 8- Weds 1st May: NO "Kizz me Weds". Back as normal 8th May and thereafter. 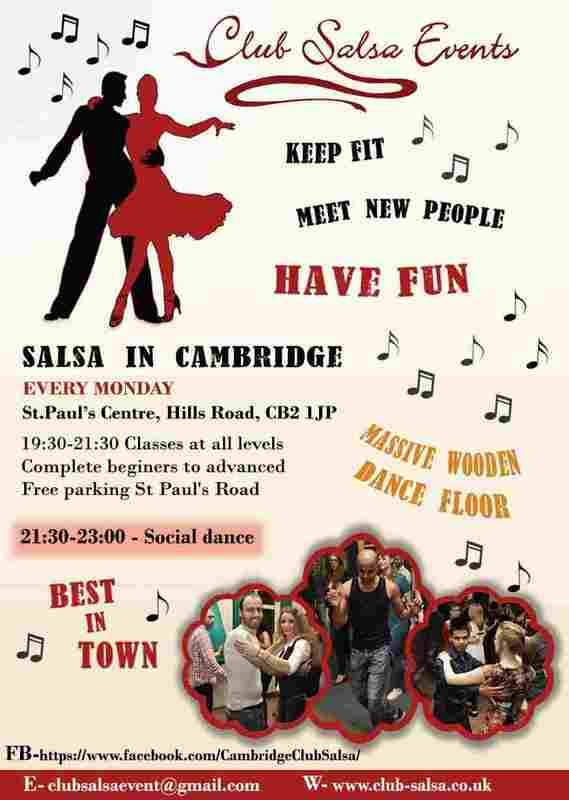 Monday Salsa at St Paul's Centre just got better! We will now teach not only Salsa but Kizomba and Urban Kiz classes as well. 20:00 till 22:00 :- Classes at all levels including complete beginners. This event is held at USC. Note that our January event will be held at St Paul's Centre and the rest of the events at USC. Classes at all levels from complete beginners to intermediate. 8pm is our first class, then 9pm is our second class. Social Dancing 22:00-01:00am. This is a very popular event as we have dancers coming from over the place. The biggest wooden-floored dance teaching room in Cambridge! Why not come and check it out, if you haven't already done so? Two full hours of Salsa classes at all levels, from complete beginners to intermediate. Now with one hour social dancing after the class. Fridays at the University Social Club: Our biggest dance night of the week. Salsa classes at all levels, from complete beginners to advanced. Two dance rooms. 19:45 - 20:00 Intro Salsa class - for complete beginners, who have never danced Salsa. We go through a few basic Salsa steps. At the same time, we run a separate shines class. These are free classes if you have paid for normal classes that start from 8:00pm. We have a new format, now teaching Salsa, Kizomba and Urban Kiz classes. If you attend a Friday class, then the following Monday you pay only �6 for 2 classes. Please write down your name on the discount list at the door. 2 Dance Rooms :- 22:00-01:00 a.m. The two-hour class is optional. Most people prefer the two-hour class as it offers value for money, you learn much more and it helps to learn Salsa much faster. Another way to become a better dancer, is to stay for social dancing. We have a very friendly atmosphere, feel feel to ask anyone for a dance. Our team members also always happy to dance with you. Club Salsa Events at the University Social Club is open to all, not just members of the University. Every Wednesday we run Kizomba and Urban Kiz classes at St Paul's Centre, upper room. We have talented guest teachers on rotation. They are Rene, Alvin & Raluca, Jey Jey. Classes are aimed all levels including complete beginners. Please note we are in the upper room. Parking:- Free designated areas on St Paul's Rd. It is a popular road to park on, so please allow yourselves some time to find a parking space. 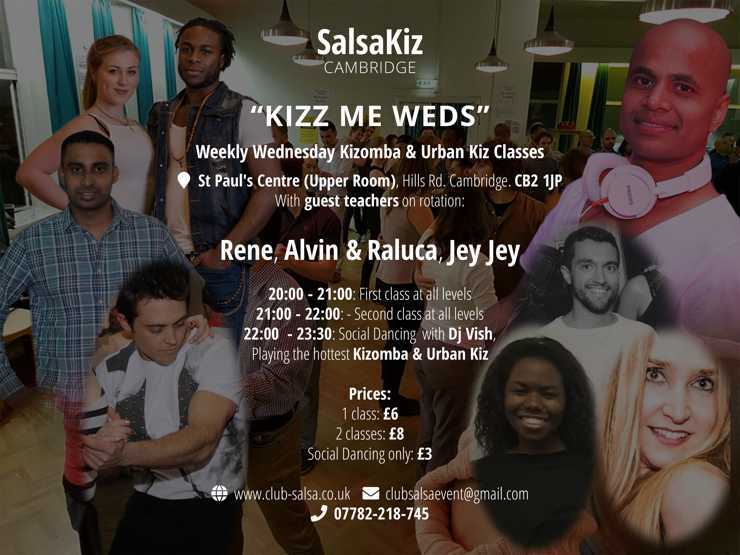 Monthly Saturday Kizomba Event "Kizz Me Cambridge"
Monthly Saturday Kizomba, Urban Kiz Bachata Event @ University Social Club. 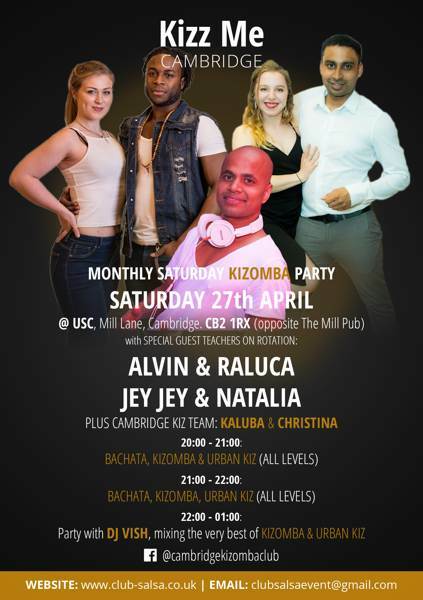 This is our biggest monthly Saturday Kizomba, Urban Kiz, Bachata party in Cambridge. We will have Kizomba, Urban Kiz and Bachata classes at all levels. Two dance rooms till 01:00am. 2019 promises to be very exciting times for our kiz dancers. We have already booked the dates and guest teachers for the entire year. On board we have the talented Jey Jey & Natalia P, Alvin Omni & Raluca B, and Zlot Joe. Guest teachers Jey Jey & Natalia. Plus our Cambridge Kiz team. Based in Cambridge, DJ Vish is available to spice up your party or corporate event! Music specialities: Salsa, Merengue, Bachata, Kizomba, Urban Kizz, Ghetto Zouk, Reggaeton, Latin, R&B, Dance, Pop, International Music, and much more. For more information email: clubsalsaevent@gmail.com or phone (0044) 7782 218745.